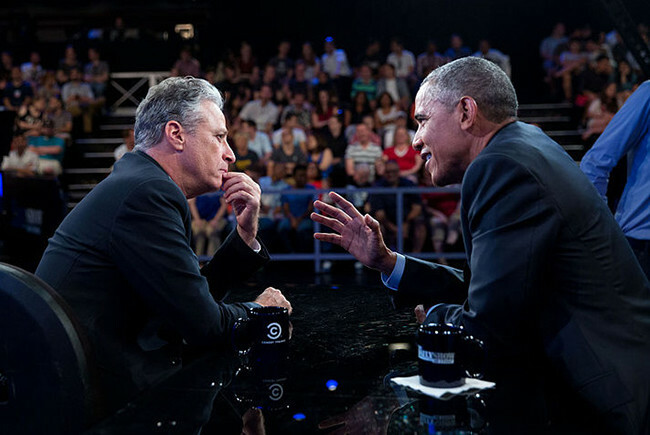 President Barack Obama talks with Jon Stewart between segments of “The Daily Show with Jon Stewart” in New York, N.Y., July 21, 2015. Official White House Photo by Pete Souza. Available via WikiMedia Commons. August 6 is coming. Jon Stewart is leaving The Daily Show. We now know the hour and the day of the reckoning and I do not envy Trevor Noah. He has taken on the most thankless job in American mass media, replacing the much beloved Stewart and trying to endear himself to an audience that has built itself around a charismatic comedic character. Noah might have that kind of charisma in him, but as the wailing and gnashing of teeth continues over Stewart’s impending departure he may have little opportunity to exercise it before the audience turns and looks for a new messiah. My religious language is intentional, but I suspect that it would make Stewart uncomfortable. In interview after interview, he maintains that he is a comedian, not a journalist. He is a satirist and positions himself in the tradition of Mark Twain. He is the court jester who speaks with moral authority and consistency. Stewart is remarkably low key and is a master of comedic monologues and dialogues. His willingness to play straight man to comics ranging from Steve Carell, Lewis Black, Larry Wilmore, and Stephen Colbert to John Oliver, Samantha Bee, and Assif Mandvi shows his ability to engage people from various racial, gendered, and religious identities, allowing a cacophony of voices on different relevant issues to echo across the parodied media landscape. It is little wonder that Fox News cannot figure him out because Stewart’s embrace of diversity and honesty is what makes for strong liberal comedy. That his successor is a mixed-race South African man speaks volumes to the multifaceted faces of diversity that The Daily Show has cultivated under Stewart’s headship. 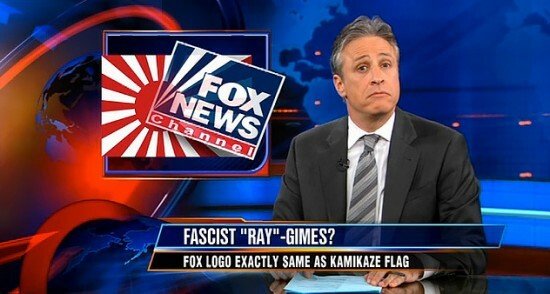 Jon Stewart comments on the Fox News logo in April 2010. 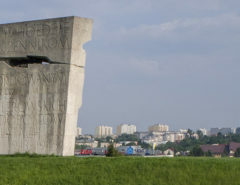 Image posted to Flikr by Peter Petrus. What I will miss about Stewart is how effortlessly he unravels news media. I have to be honest, Stewart’s standup strikes me as adequate at best, but he is an undisputed master of sorting through masses of media and arranging the quotes so perfectly that the underlying messages, ideologies, inconsistencies, mistakes, and overzealous exaggerations that characterize the 24 hour news cycle become apparent and laid bare for all to see. Stewart’s comedy is distinctively twenty-first century mass-mediated humor. As a scholar, I appreciate what he does because he brings his data onto the show every night and presents it in a logical, thorough, and unflinchingly honest way. Even if Noah continues this tradition the way that Stephen Colbert and John Oliver have on their respected programs, Stewart is this art’s guru in all senses of the term. When Stewart has to tell a monologue in a standup setting, he has to own the stage and he is far too humble for that. Stewart’s comedy comes from a moral disgust with politicians and journalists—the people charged with overseeing the country and keeping the citizenry informed—who fail to fulfill the roles that they occupy. In so doing, he brings a perspective that works for millions of people around the globe into their homes and cuts through the repetition, fear-mongering, and incomplete stories that comprise mainstream news media. Being on television enabled him to use mass media’s tools to convey his expansive vision. His ability to refer to past tapes and failed claims is an invaluable check on short-term memory. The Daily Show under Stewart’s watch has been a consistent left-wing American political commentary that has both the memory and tools to catch people in their inconsistencies. In this, Stewart is not just a critic, he is able to use the show to present a sacred ideal—that truth, honesty, perspective, and humility could present the progressive American dream. Furthermore, he presents a hopefulness about the fact that the dream could be achieved if people do the right thing, as his own pressure to pass the 9/11 First Responders Bill demonstrates. At The Daily Show’s heart is both a cynicism for our current political and media leaders and a firm belief in the potential for good people to occupy positions of power and do the right thing. Stewart himself became a symbol of that integrity. That is why we will miss him. Stewart is the most trusted man in news in part because he has weak competition, but also because he was always true to his perspective and was not trying to crush the competition. The CNN Crossfire interview from 2004 with Paul Begala and Tucker Carlson, which was for many the turning point in Stewart’s career, encapsulates much of what I have been discussing. Stewart is not exaggerating. He is serious in his tone and body language. 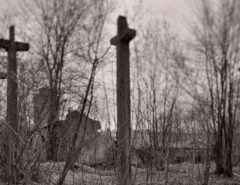 He is cajoling and mocking the entire Crossfire format and his request to “Stop. Stop hurting America.” was heard not as a punch line, but as a plea for sanity by people who acknowledge that democracy embraces difference and that while there are political differences in the country the purpose of having a small group of elected representatives is that they should be able to find compromises and reconcile them instead of getting into fights and then sulking if they lose. Stewart’s honesty and integrity are central to his humor and the way that he wove a serious, playful joy into the Daily Show. Stewart’s seriousness is probably best marked in both his monologues and his interviews. Day after day viewers have seen Stewart’s team piece together monologues with taped effects that are beautiful satires. Stewart and his team take evidence, weave it into an argument, and present it for consideration. Each joke is an attack from a place of moral certainty that resonates with a wider set of values and ideas than just a simple pun or double-entendre. Whether or not one agrees with The Daily Show’s interpretation of events, The Daily Show’s team at least brought their evidence. For example, Stewart was able to turn to his knowledge of the raw data on Jim Cramer’s Mad Money program when Cramer came on The Daily Show. The interview mixes the humorous and serious aspects of Stewart’s satire together brilliantly (now formatted online in a three part series: Part 1, Part 2, Part 3). Watch as Cramer is caught between Stewart’s exposé and the basic moral questions of why CNBC did not take a leadership role in informing people about how markets actually work and you can see how Stewart masters his data, catches Cramer in his inconsistencies and moral failures, and paints a way forward to a more ideal future. 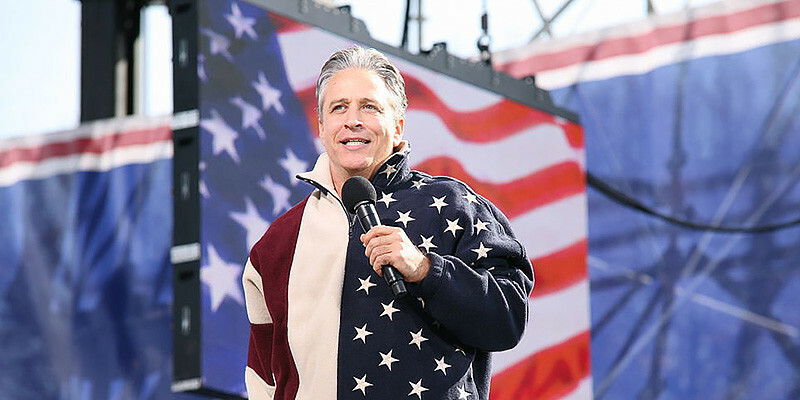 A screen capture of Jon Stewart’s “Rally to Restore Sanity” announcement on Comedy Central’s “The Daily Show,” September 16, 2010. The interview chair is a place where Stewart invites guests to share their ideas, but he also invites people with whom he disagrees and engages them in intelligent disagreement. It is in these discussions and debates that Stewart helped weave an ongoing narrative about where and who we are and where and who we could be and he did not just restrict himself to his ideological allies. His debate with FOX News’ Bill O’Reilly (“The Rumble in the Air-Conditioned Auditorium”) shows that the two men disagree, but also engage each other. It is the interplay between this serious political engagement and his humorous unveiling of powerful people’s lies through his humor that has made Jon Stewart a household name. His mixture of personal integrity, rapier wit, keen insight, and consistent moral standards has helped Stewart build a personal charisma and a sacred brand, one which Comedy Central’s executives must be cringing at the thought of losing. Stewart’s audience is not just invested in the worldview Stewart propagates. They are invested in him as a moral exemplar of that world. In this sense, he is sacred. Jon Stewart has been consistent in his critiques, principles, and humor for so long that we forget that he is a downright funny man when he can present his examples in a clear and ordered way through a cable news parody. Stewart’s own example provides the moral standard that the audience can share, so that when Stewart shows just how corrupt something like Cramer’s stock market advice or Crossfire’s “debate” style are, the fact that those programs should be treated as serious is revealed as a logical flaw and if we agree with Stewart’s position we laugh. In all of this presentation and satire, Stewart is a genuine “host.” He invites us into his world for a while and shares his perspective in a friendly manner. We do not yet know if Trevor Noah has that quality and that is what makes Stewart’s departure even more frightening. The Daily Show is built on Stewart’s ability to bring people into his world and let them speak, but it needs the host to orient viewers. Without that centripetal force, The Daily Show is sketch comedy and not a finely interwoven forum of satirical journalism. Stewart is giving Noah an election to start with, but Noah is not only going to have to find his voice fast, he is going to have to find a way to build bridges with the audience so that they will want to be invited into his world as much as they enjoyed visiting Stewart’s. Noah’s problem is that while the sacredness of some of Stewart’s values—honesty, personal integrity, humility, collaboration, a patriotic belief in the potential goodness of America—is available to those who want to try and embody those values, Stewart’s personal spin on them is not. In fact, Stewart’s example stands in Noah’s way of crafting his own persona as an immigrant of mixed race and ethnicity stepping into this distinctly American venue. Noah could do some interesting things with the combination of those values and his outsider statuses, but whether or not he survives the audience’s loss is another question. Noah will not have sixteen years to build himself into the figure he replaces. The attacks began quickly and more will come as his every joke is dissected in real time. 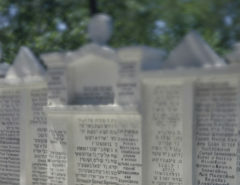 That is what happens when an order that is built around someone sacred comes to a close. 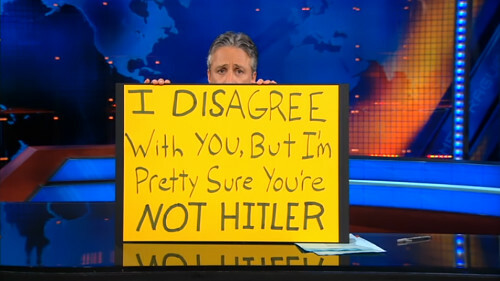 The energy people invested in the individual and their institution has to go somewhere and so long as Stewart is alive and doing other things, The Daily Show will have to fight against the “What if Jon were still hosting” problem. Screen shot of a December 5, 2014 episode of Comedy Central’s “The Daily Show with Jon Stewart.” Outgoing host Jon Stewart talks about Africa with incoming host Trevor Noah. An original and transformative work by the editor. So is there a lesson in this for Sacred Matters readers? To paraphrase comedian Bill Hicks from the end of his Revelations show, I think so. I have to, I wrote the piece. When we look at some of the greatest comedians and comedic programs of the last century we see some of the most fascinating people coming into our towns and our homes. They come to bring us their wisdom, their insight, their pains and joys, their reflections on life, and they ask us to laugh with them and, sometimes, even at them. In so doing, we connect with some of them. Richard Pryor and George Carlin are immortalized because of how they connected and continue to connect. Bill Cosby has recently fallen from his previously lofty heights, but we should not forget how highly he was esteemed and the multiple audiences with whom his humor resonated. Ellen DeGeneres is now the voice of daytime talk shows. Amy Schumer is taking off as a voice of feminist comedy that cuts through the issues of the day with her painfully funny sketch comedy that is at its best when exposing the massive restrictions and indignities women face. Jon Stewart belongs among these comedians because he is able to connect the everyday pains people feel with the disconnect between their lived realities and their aspirations and he showed how those who could help us to achieve those aspirations failed at their jobs. The Daily Show will forever be stamped with Jon Stewart’s vision and the charisma that came from him sitting behind the desk as the ringmaster in his circus. Comedy done like Stewart does it is a sacred art. It reveals our aspirations, our failures, and a human potential, but in Stewart’s hands it is brought to us by that combination of the person in the venue embodying and espousing those values so sincerely that what is normally set apart is manifestly present in an exemplary person. So long as it is embodied, others can aspire to those standards no matter how distant and lofty they seem. In that light, Comedy Central’s problem is Trevor Noah’s problem. Noah is not inheriting The Daily Show. He is inheriting The Daily Show with Jon Stewart and the latter half of that title is something he can never be. The angst, the hand-wringing, and the frustration that surrounds Stewart’s departure is not just about Noah’s selection. Former correspondents with successful shows like Stephen Colbert and John Oliver would be a little more accepted, but they can never meet their mentor’s standards in the audience’s eyes. No one can. That is the sacred power of comedic charisma and it’s not a joke. David Feltmate is Assistant Professor of Sociology Auburn University at Montgomery, specializing in the sociology of religion, religion and popular culture, and the sociology of humor. He is currently revising and expanding his dissertation “Springfield’s Sacred Canopy: Religion and Humour in The Simpsons” for publication. He can be followed @DavidFeltmate. For a good example of the sacredness of American values that public figures can use to forge their own personal political charisma, see Jeffrey Alexander’s The Performance of Politics (Oxford University Press, 2010) which covers the 2008 Presidential campaign.